Anne Forsyth celebrating after a stellar 1500m showing. 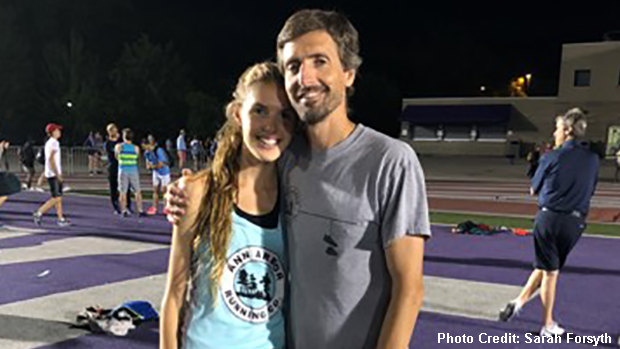 New Balance Nationals and the USATF Junior Championships weren't the only big meets taking place last weekend, as Michigan's Anne Forsyth traveled north of the border to compete in an elite 1500m race in London, Ontario. Forsyth, who is a recent graduate of Ann Arbor Pioneer, finished fourth in her section at the London Runner Distance Series #3 in an impressive time of 4:27.14. The high quality meet featured international pros, Amanda Eccleston and Kate Van Buskirk in the following section. Anne Forsyth's latest accomplishment complements a season where she won the 3200m event at the MHSAA State Championship LP-1 due to her 10:08.07 effort. The University of Michigan signee is ranked third in the state in the 1600 and sixth in the 800 from her season best's of 4:48.28 and 2:11.83, respectively. MileSplit Michigan tracked down Anne to gain more insight on her 1500m performance. My major goal this year was to qualify for the Canadian world junior team in the 1500. After dealing with health issues throughout the year, I wasn't sure if that would be possible, but after State's I knew I was feeling healthy and had a small chance of making it. My dad had already looked into two 1500s in Ontario (both were last week). In London I ran my season best, but did not run fast enough to make the team. I'm not really disappointed at all, just grateful to have been feeling strong enough to go and race such great competition even after a disappointing year overall. I chose to race those 1500s as opposed to New Balance or USATF because again, I was looking for a chance to make the Canadian team. I've always been a dual citizen, and last year I made the decision to represent Canada when there's an opportunity, so that's why this year I didn't really consider going to any US Championships. It was a lot of fun to go to these races and be in the same race as Olympians and other accomplished runners because not being ranked highly took a lot of the pressure off. Overall it was a great week to end the year because although I didn't run my fastest time, I still got to race at a level I hadn't competed at since last summer and that felt really good. Next up for Anne Forsyth will be her freshman cross country campaign for the University of Michigan Wolverines.